Contact Details : Contact the Authorised Officer, Sri.NTR Rajasekhar (DGM) 9100072161, Sri T.V.L Padmanabham, CM, 9949624490, Sri Venkata Subbaiah, CM, 9959988583. Schedule of Property : Property No. 2) All that the Part of Shed with plinth area 1000 sq.ft on plot Plot No:A-7 & A-8 Parts, admeasuring 1250 sq.yards or 1045 sq.mtrs in Survey No. 610 * 612, Situated in Industrial Estate, Moula-Ali, Under APIIC IALA Moula-Ali Municipality, Malkajgiri Mandal, Rangareddy Dist, admeasuring an area of 1250 Sq Yards standing in the name of Sri.Hitesh Ramesh Jain, Bounded by: North: Part of Shed on Plot Nos:A-7 & A-8 Parts, South: Plot Nos:A-11 & A-10, East: 40 Wide Road, West: Part of Shed on Plot Nos:A-7 & A-8 Parts. 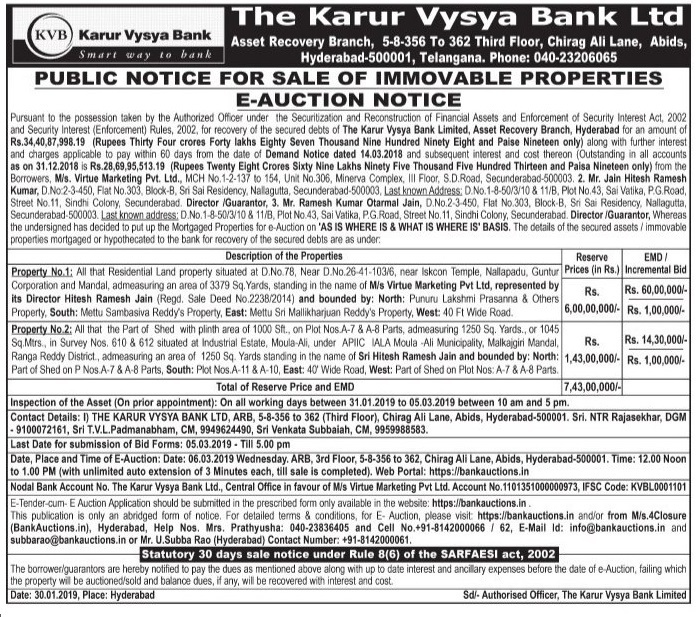 Inspection Details : For Inspection Details Please Contact the Authorised Officer, Sri.NTR Rajasekhar (DGM) 9100072161, Sri T.V.L Padmanabham, CM, 9949624490, Sri Venkata Subbaiah, CM, 9959988583, Inspection Of The Assets On All Working Days Between 31.01.2019 To 05.03.2019 From 10:00 AM To 05:00 PM.